I look back on my childhood with a nostalgic wistfulness. I can remember long, lazy summers in the garden, whiling away the hours playing. We had an old metal, single swing under a tree and it provided my brother and I with endless hours of fun. It's every child's dream and one of life's simple pleasures. So when we had the opportunity to get a swing for Bubba, I jumped at the chance. 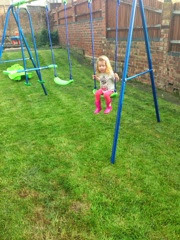 She already has a slide which we got for her birthday so I chose a double swing set to complement it. 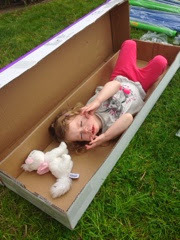 When the box arrived (with a picture on the side which gave it away) Bubba could hardly contain her excitement. 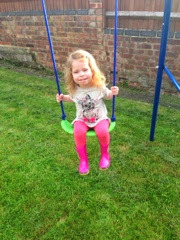 She had an on the spot tantrum because I wouldn't go out in the rain and put the swing together, she swiftly followed this with another tantrum because I said she also could not go out and make up the swing on her own! With the arrival of a gorgeous sunny Saturday, I sent hubby into the garden to put the set together (with her help!!). All parts were numbered and seemingly easy to put together and quickly she was able to swing to her hearts content. It's a lovely sturdy piece of equipment and although I little too big for our girl to get on and off alone (we knew this beforehand) it's something that will hopefully be used by her and her brother as they get older. It's got adjustable swing ropes and the see-saw will also provide great entertainment for when they are bored of swinging (as if, it's one of lifes simple pleasures). At the moment I can't see her tiring of swinging as we've been on it every day so far. 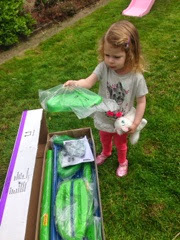 In the words of Bubba "it's like a playground at our house every day"
In future I would definitely look for more garden toys from Asda. Their range is great and we were impressed with the quality of the swing.